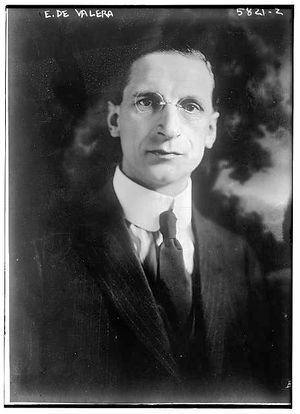 Éamon de Valera (1882-1975) was born in New York City in 1882. Following the death of his father, he was sent back to Ireland, at the age of two, to be reared by his maternal family. A teacher by profession, he became involved in the Gaelic League. In November 1913, he joined the Irish Volunteers and quickly rose through the ranks. He was then invited to join the IRB. During the Easter Rising, he commanded the forces controlling Boland’s Mills. Imprisoned and sentenced to death after the surrender, he escaped execution, at least in part because of his American citizenship. De Valera went on to play a leading role in the Irish War of Independence and led the anti-Treaty side in the Irish Civil War. He left Sinn Féin and founded the Fianna Fáil political party, serving three times as head of Irish government (as Príomh Aire (prime minister), as the second President of the Executive Council and the first Taoiseach) and twice as head of state, the President of Ireland, serving two terms from 1959 until 1973. He died on 29th August 1975. This page was last modified 17:35, 28 September 2007.